Just back from my first hard ride on the new ICE VTX. Wow. I don’t want to give away too much, but this not just a cosmetic facelift. Just drop me a comment in the box below if you have any specific questions – I’ll collect these and answer in the full review. I bought a Fuego because I wanted something faster than my Trice QNT, partly on your recommendation. 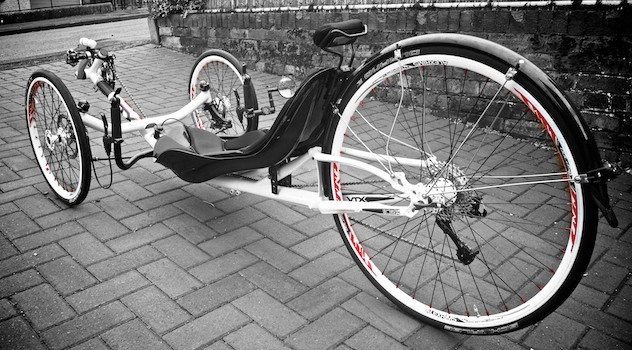 I’ve not been disappointed… it’s a lovely bike, and I’m quicker on it than anything else I’ve ridden, DF or recumbent. Why am I going on about a bike and this is a trike? The Fuego still gives me the collywobbles going up hills (particularly steep ones) and on loose surfaces in a way the QNT never does. So, is the VTX as quick as a Fuego? If so I’d be thinking hard about a trade in, much as I enjoy it, because I do miss the confidence the trike inspires. But I’ve still got the QNT (and ride it lots) so it would have to be clearly faster to make it worth swapping the Fuego. I don’t think I’d ever willingly part with the QNT! I guess my question really boils down to: how does the VTX compare to a quickish low racer style bike? Graham – I’m not sure the VTX would outrun many two-wheelers, at least not the ones designed for speed. As you say, it’s all about being a trike (albeit a very fast trike). The Fuego… maybe. I’m going to be spending time on the VTX with power measurement to attempt to answer some triking questions, so will definitely try to tackle this one specifically, by borrowing Laid-Back’s Fuego for comparison. I started recumbent riding on a trike, a base range KMX Cobra. Not the lightest thing in the world and not in the same league as Ice but then only use it for commuting to and from work over 4 miles each way. 4 years later I was after speed so the Raptobike came into my life. Lovely! I want a Vortex! Or now the VTX. Yes they might be slower than 2 wheelers in some respects but there is nothing like relaxing on a trike and going almost every where just feeling that little bit more planted. Junctions, no worries. Mud, rain, ice snow leaves… just there. I think about the road conditions before going on the Raptobike. Not with the trike! Downhills and corners are sublime when others are warning and fretting because it’s wet or leaves about. The cost is the deciding factor but I still want one! Looking forward to your thoughts on ride and cornering. And winning lottery ticket. It would be very interesting to know what additional power output is available on a trike as opposed to most two wheel recumbents due to the more stable platform and the steering set up.I am thinking of the ability to arch the back and raise the derriere off the seat and thereby simulate to some extent the dancing on the pedals a DF rider can employ and also the ability (at least on my windcheetah with the joystick steering) to push alternate knees with arms and hands. Even with my puny arms which are only otherwise exercised in raising wine glasses to my lips, I notice an immediate 1 mph or so increase while slogging up a long steep incline at about 8 mph. I am sure someone who worked out their upper body could use their arm muscles in this way to greatly enhance their power output which would otherwise just derive from lower body/leg muscles. Hope your power measuring gizmo can quantify the contribution that some of these trike specific techniques can contribute.